A variety of class offerings, covering all skill levels. Professionally coached, youth sports at its best! 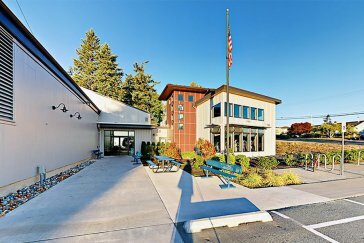 Explore what Fidalgo Pool and Fitness Center has to offer you. Click on the link below to view a 3D virtual tour of our facilities. Click below to watch some video samples of workouts and swimming classes. 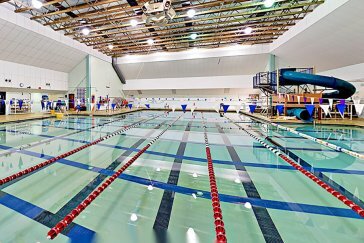 We are providing Swim lessons for the 2018-2019 school year for all Anacortes Schools 3rd Grade students from 1:00pm.-2:00pm. Thursday’s and 12:30pm.1:00pm. Friday’s through May 2019. If you typically come in during these times, classes held will be utilizing part of the shallow end and slide area. Lane 1 may also be utilized for upper levels. Thank you for your understanding as we teach our community safety around water and swimming skills. The District has a 25 meter x 25 yard 280,000 gallon pool. The water is treated with an ultraviolet system–chlorine usage is minimal and prevention from water-borne illnesses is optimal. The average temperature of the water is 83 degrees. Extras include a water slide, one-meter diving board, Wibit course, inner tubes and more! The District’s fitness center offers a variety of group fitness classes for every age and ability. Precor strength training equipment, free weights, treadmills, elliptical trainers, a recumbent bike, an upright bike and more are available for your workout needs. We offer SilverSneakers®, Tivity Prime®, Silver & Fit®, Optum At Your Best® and Optum Fitness Advantage® for eligible adults through their health insurance plan. Hours of Operation: The Pool & Fitness Center is open 5AM-8PM Mon-Fri. On Saturday, the Fitness Center is open 7AM-5PM; the pool is open 9AM-Noon and may also be open in the afternoon depending on availability–please call. On Sunday, the Fitness Center is open 10AM-5PM; the Pool is open 11AM-2:30PM.